Restrict folder/file access to particular groups or users. Driven by real-worlds needs, finer control are available, for instance allowing file modification but denying new folder creation. When author and title are not enough, and you want extra metadata like barcodes or customer identifiers, just create custom properties. Custom properties are searchable too, enabling better document reuse. 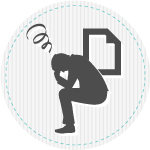 Find your documents, not just by metadata but also by searching their content. See all versions of a document. Revert to an earlier version if necessary. Want to lock a document so that just you can modify it? NemakiWare uses the industry standard way to do it, compliant with all CMIS clients. Teams collaborate in the context of "sites", for instance "Marketing", or "Project X". Easily create new sites and invite collaborators. Where is the document I want? Is this really the latest version of this file? People create redundant folders hierarchies on their own with no possible regulation. Files get lost, for instance by erroneous overwrite. Search takes a long time, and does not even find. 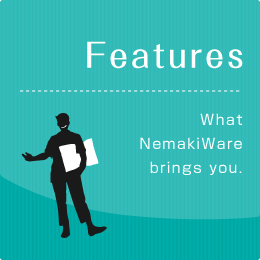 More than a file server, NemakiWare is an ECM (Enterprise Content Management) platform that can solve all of these problems. Setting up a company-wide ECM can take time and be costly. And if not done properly, employees will disregard the ECM as inconvenient and start exchanging files by email. 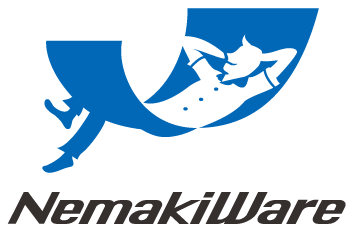 NemakiWare is the best for a small, efficient and successful start. 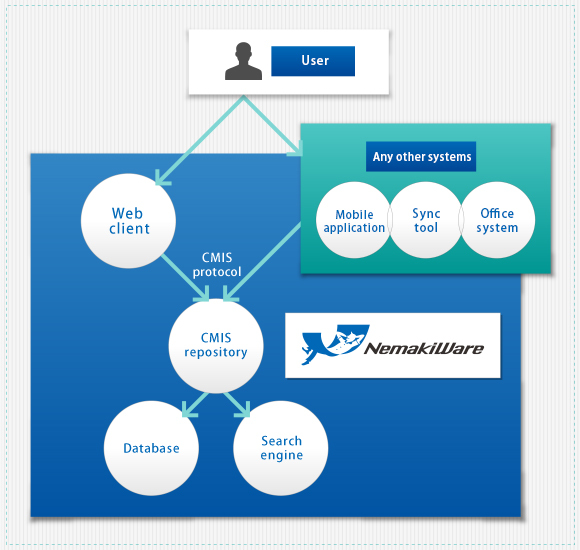 Because NemakiWare's protocol is the industry standard CMIS, it can be used with any CMIS-compliant client or business application. 1) Simply add some commodity hardware, and NemakiWare scales. 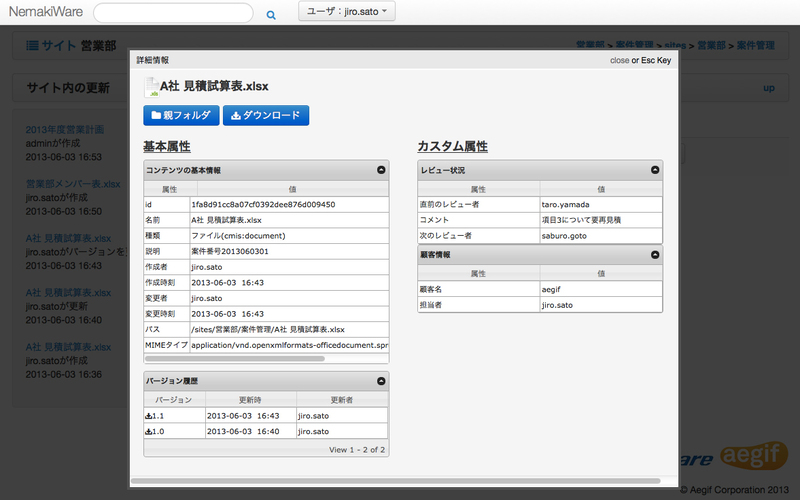 Unlike other ECM products, NemakiWare is based on a scalable database: CouchDB. 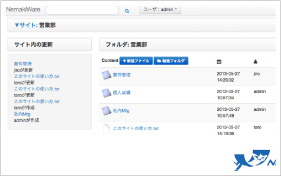 2) If for any reason you want to switch to another ECM product, it is easy. Because all ECM products have adopted the CMIS standard, employees won't even see the difference (data migration is needed, but is also eased by CMIS). CmisSync synchronizes files to your local computer, where you can open them and modify them faster than ever. This allows your company to get the benefits of ECM without any efficiency drawback. Aegif provides professional technical support for NemakiWare. We investigate any problem, and provide patches and workarounds when needed. Aegif gets you starting with the installation, connection with your authentication server, and data import. Become efficient within days! 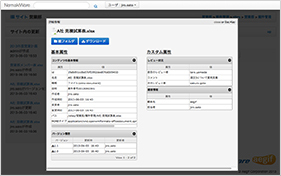 Aegif provides both administrator training and user training for NemakiWare. Aegif provides consulting for content-oriented applications, collaboration improvement, and ECM in general. In particular, Aegif provides advisory and services for integrating NemakiWare with existing applications and other ECM products. ©2013 Aegif Corporation. All Rights Reserved.